The anticipation of another showdown with the Bambino transformed Wrigley Field. Temporary bleachers held the overflow of the 50,000-strong crowd that bright September day. Game 3 of the 1932 World Series between the Cubs and Yankees stood locked at 4-4. An angry mob, rocking the ballpark with pent-up fury, aimed itself squarely at him. He had never experienced anything like it. But above the almo… st deafening noise, the slugger could hear the tide of barbs pouring at him from the Cubs' dugout. They called him a busher, a fat slob, and other names not fit to print at the time. He took the first pitch for a strike, stepped out of the box, and collected himself. Cubs pitcher Charlie Root threw two balls, and Ruth watched a fastball cut the corner to set the count at 2 and 2. On the on-deck circle, Lou Gehrig heard Ruth call out to Root: ';I'm going to knock the next one down your goddamn throat.' Ruth took a deep breath, raised his arm, and held out two fingers toward centerfield. As Root wound up, the crowd roared in expectation. It was a change-up curve, low and away, but it came in flat and without bite. The ball compressed on impact with Ruth's bat and began its long journey into history, whizzing past the centerfield flag pole. No one had ever gone that far at Wrigleynot even Cubs hitter Hack Wilson. Estimates put its distance at nearly 500 feet. Ruth practically sprinted around the bases. Video cameras of the day raced to catch up with him, his teammates cracking that they hadn't seen him run that fast in a long time. Then he flashed four fingers at the Cubs infielders and their dugout: The series was going to be over in four games. 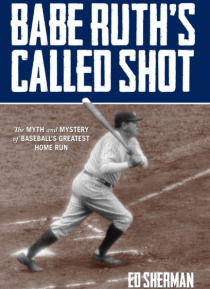 In that moment, the legend of the Called Shot was born, but the debate over what Ruth had actually done on the afternoon of October 1, 1932, had just begun.